Are you looking for a quiet power source for your hunting or camping trips? Or perhaps you need a backup power source for your home? 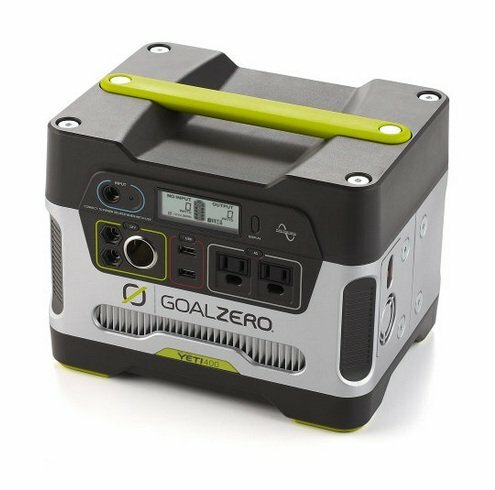 The Yeti 400 from Goal Zero is an impressive solution for a variety portable power problems. Before we dive into a full review of the Yeti 400 let's clear up a couple points about solar generators in general. There are lots of products on the market now days touting themselves as solar generators. This and many other products CAN be recharged using solar panels. That said, there are limitations in terms of HOW MUCH power they can provide on an ongoing basis. This isn't to say they aren't worthwhile. After all, when you're deep in the woods the options for power are obviously quite limited. But before you drop your hard earned cash on a $500+ piece of equipment let's make sure you clearly understand what you're getting. The Yeti 400 is essentially a rechargeable power station. The number in the names of the various Goal Zero products represents the amount of power they provide. In the case of the Yeti 400 that is 400Wh (watt/hours). So this model is capable of powering a 100W load for 4 hours. Picture a 100W light bulb. You can keep that light on for 4 hours before this unit would need to be recharged. If you want to know what some of your electronics draw you can check on this chart. The Yeti 400 is designed to provide portable, rechargeable power for wide variety of circumstances. This might include hunting, camping, tailgating, or even when there's a power outage in your home. While it IS capable of running electronics like a TV or small fans, it's really designed to be a recharging station for things like laptops, phones, cameras, and tablets. Simply plug them in using a USB or traditional power cord and it's just like plugging them into a wall. Because it uses an inverter the power it provides is oftentimes cleaner than what your local power company provides. Ideally you would fully charge the unit before heading into the woods. Once there you would hook up the solar panels to keep the units internal battery topped off. So long as your electronics don't overwhelm it's charging capabilities you'll have power for the duration of your trip. This Yeti 400 is NOT designed for hike-in camping. The recharging station alone weighs in at 29lbs and this doesn't include any of the solar panels which are also quite big. While it does offer 400W/hrs of clean power, the Yeti 400's internal battery does not recharge quickly, especially when solar is the only option. This isn't a limitation of this particular product, but of the category as a whole. Thankfully solar recharging is one only option. It can also be charged using a standard wall outlet or the 12V connection from your car. This is important because even with their largest solar panels recharging the unit takes anywhere between 9 and 18 hours. So unless you have multiple solar panels and lot's of sunshine you have to monitor your power usage somewhat closely if you'll be using higher powered items like TVs. Do NOT expect to be able to use a portable heater, hairdryer, or other high wattage device with the Yeti 400. These sorts of electronics are WAY beyond it's intended load. If you need to power these types of devices you're better off looking a portable inverter-type generator, which we cover here. It is truly intended for smaller devices and should not be considered as a backup generator f﻿or your home unless only used for small electronics. If you're looking for something that can provide lots of continuous power you'll be better off going with a gas powered portable inverter generator. The Yeti 400 works very well in a wide range of circumstances. To ensure you get the best performance you'll definitely want to make sure it's completely charged before using it. We found leaving the unit connected to a solar panel when not in use is a great way to keep the battery topped off, healthy, and ready for use. This of course means leaving it in a place that gets regular sunlight. The Yeti works very well for recharging devices like phones, tablets, and digital cameras that draw relatively low amounts of power over longer periods of time. Laptops, TVs, and other devices that draw more current tend to drain the battery much more quickly. Cold weather has a very significant impact on the lead-acid battery's ability to store power. If you'll be using it in cold weather (below 38 degrees), you'll want to store the unit in a cooler to help keep it warm. To get more that 400W/hr of power the you can chain 2 400's together to double the available power. Keep in mind that recharging will take longer due to the additional batteries. If you truly want to leverage the solar charging capabilities of the Yeti 400 you'll want to look into purchasing the Boulder 90 solar panels. They offer the most recharging power in the shortest amount of time. Each panel is 32"x32"x1.25" in size. With one Boulder 90 attached you can recharge your Yeti in anywhere between 9-18 hours depending on the intensity of the sun. You can also use the Boulder 30, and Nomad 20 solar panels. They are smaller in size but they also produce significantly less power. The most important note on maintenance is ensuring your Yeti is stored in a cool dry place. This is critical to keeping the battery in good shape. As we previously mentioned you should also keep it hooked up to power if possible. Should you need a replacement battery, you can purchase them easily enough. They are 12V 35Ah lead acid and can be purchased online or at an automotive parts store. So long as you understand the power limitations of the Yeti 400 it's an excellent source of power (or backup power) for a wide variety of circumstances. It's not going to offer as much power as a portable inverter generator, but it is totally silent, offers very clean power, and can be recharged using solar energy. The maintenance is basically nil and it can be daisy-chained for even more power. Of the products available in this category, the Yeti is definitely our favorite.